When God gives us a dream, we often have to take the first step of faith before He shows us what to do. God usually works with us step-by-step, requiring numerous steps of faith during the journey. Some of our prayers need action before God can answer them. When God sees we are serious about our requests, He will answer them in His way and timing. It’s hard to wait to hear from that agent or editor. We want immediate results. Instead of waiting impatiently, if we keep busy on the next writing project the time will seem to flow faster. If we’re determined to achieve the goals God has placed in our hearts, we will persevere despite obstacles and setbacks. You might be shaking in your boots about your appointment with an agent or editor. However, proceeding despite your fear will help you gain confidence. The people you meet initially may not be the one God has in mind for you, but they might introduce you to the perfect match. It hurts when another writer or agent finds imperfections in your writing, but instead of getting upset, learn from your mistakes and move forward. You will never win writing awards if you don’t submit your work. If you win—great. If not, learn from the experience and continue to submit to other contests. 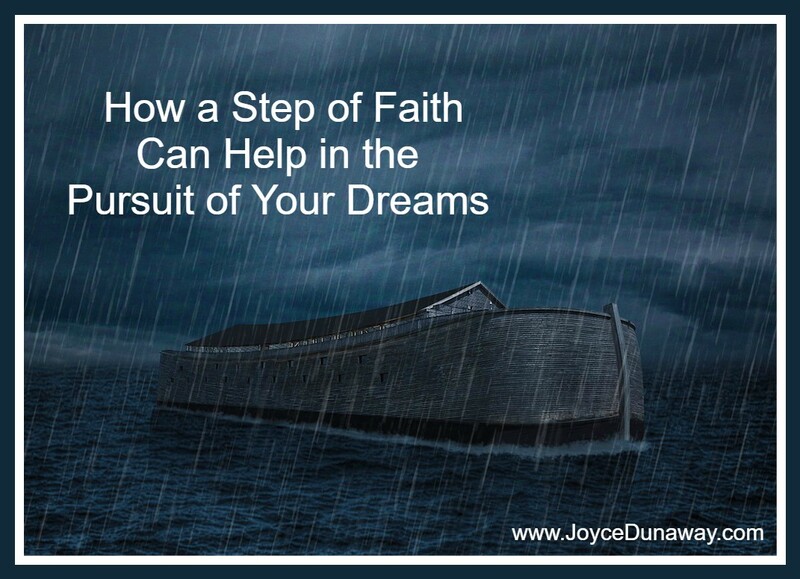 I would love to hear how stepping out in faith has helped you in the pursuit of your dreams. Please share your thoughts in the comment section below.